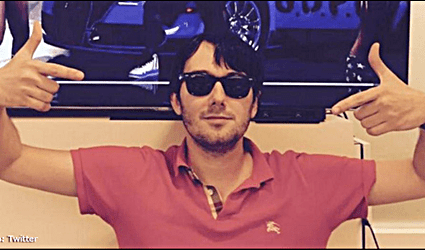 Skeevy Pharma douche-bro Martin Shrekeli has changed his greedy little mind on lowering the price of Daraprim a drug used to treat a parasitic infection and often given to HIV patients which he raised over 500% to $750 a pill after buying the company who made them originally for $13.50 a pill. Turing Pharmaceuticals AG will not reverse its decision to raise the price of a decades-old drug, Daraprim, by more than 5,000 percent, backing out of previous statements that it would cut the cost by the end of the year. In an announcement on Tuesday, the company said that the list price of Daraprim, which jumped from $13.50 a pill to $750 a pill earlier this year, will not change. Instead, the company will offer hospitals up to 50 percent discounts and will make other adjustments to help patients afford Daraprim, a drug used to treat a parasitic infection and often given to HIV patients. Where is ACT-UP? The fact that his company is not under 24 hour protest saddens me greatly. They sure don’t make activist like they used to. Shrekeli’s company, Turing Pharmaceuticals is currently under investigation by the Federal government for price gouging.